Mark James Pearson (Filey, UK) & Maina Handmaker (Manomet, USA) were just two of more than 150 delegates attending IBOC 2017 representing bird observatories, ringing stations and research facilities from around the world. Mark & Maina look back at a hugely inspiring, productive and bird-rich few days on the eastern seaboard. A deceptively simple and yet perfectly-formed distillation of a Bird Observatory, and one which became ever more potent over the following days as the diversity, and the breadth of the spectrum within which we all occupied, became increasingly evident – something which was championed and celebrated over four memorable days on the Jersey shore. CJ also asked us to consider every bird observatory as a biological species: a dynamic organism that adapts over time through creation, specialisation, growth, maturation, and change; occasionally, one might even go extinct, while others spring to life. Over the course of four days, we learned from bird observatories at every phase of this life cycle. Some spoke of the patterns they’ve witnessed through more than a century of ringing data, while others were there to glean inspiration as they established brand new observatories; many more were at various points inbetween, sharing ideas and forging lasting partnerships. Some are run entirely by volunteers, with no paid staff or premises at all; others are fully funded by government, incorporated as non-profits, run as successful businesses or embedded in a research program at a university or research organisation. Some are tiny, while others are behemoths of research, education and outreach – and again, many more are somewhere inbetween on the uniquely diverse observatories spectrum. Some are using incredible new technologies to push the bounds of what we know about migration. Radio telemetry, light-level geolocators, and GPS satellite transmitters are revealing migration routes that have long been mysteries. Reading weather radar and recording flight calls at night is helping discover patterns of nocturnal bird migration. And yet, the most important tools at many bird observatories are human eyes and ears, an unfaltering passion and a few pairs of ringing pliers. 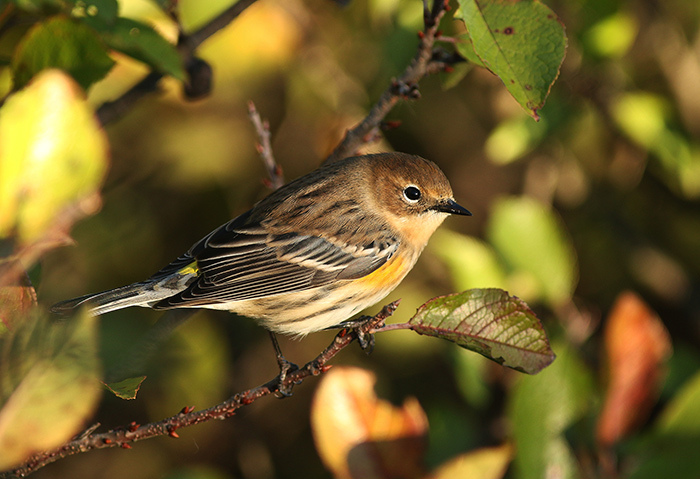 When standardised over many years, census and ringing data contribute crucial context to our understanding of migratory bird populations - the high-tech is not replacing the low-tech, but they support each other in the quest to answer our biggest conservation questions. We are all collecting data on birds and bird migration. We all analyse our data to decipher meaning from our research. community or through dedicated outreach and education programs. We are all motivated by the hope to inform and inspire effective conservation action. The IBOC was founded to encourage bird observatories to collaborate towards these common conservation goals, and what a success it was. 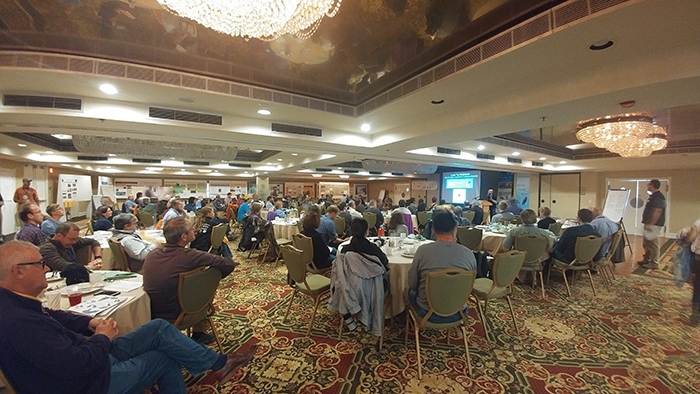 The Cape May / New Jersey Audubon team did a sterling job of not only organising and administrating IBOC 2017, but also of creating a wonderfully informal, friendly and co-operative atmosphere that, for us, was the real secret ingredient to the conference's winning formula. As bird observatories, there is incredible potential to share our data, our funding strategies, our education programs, and our research methods - to strengthen each others’ work, and, ultimately, to better protect the birds we all share. And then, of course, there were the birds themselves – or, as Cape May Bird Observatory's perfectly succinct tagline has it – SO. MANY. BIRDS. The end of October may not initially seem like a particularly special time to visit a peninsula well up along the eastern seaboard of the United States, but like so many premier coastal hotspots, Cape May specialises in seasonal longevity, with overlapping primetime slots for the various waves of migration. The local's knowing assertions that there would indeed be plenty to enjoy was good enough for us, as it should have been; and as a communal experience, it united us all. When we lowered our binoculars, we bumped elbows with a ringer from Brazil, brushed the arm of an interpretive naturalist from Canada, or backed into the scope of a new friend from Finland. 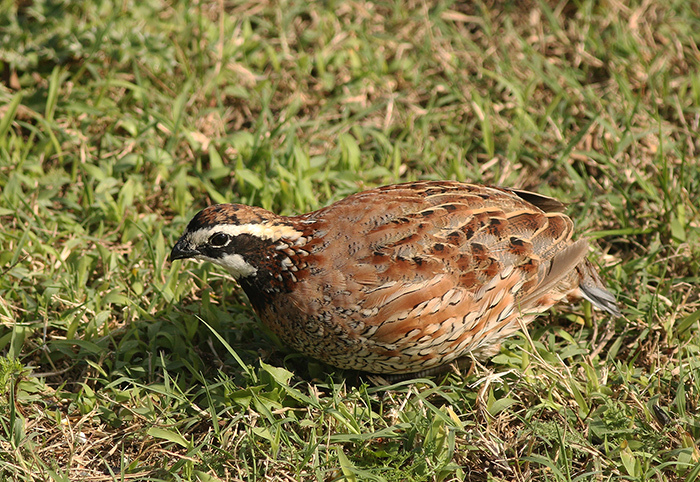 Birds know no borders, and at the IBOC, there were no barriers between bird observatories, either. 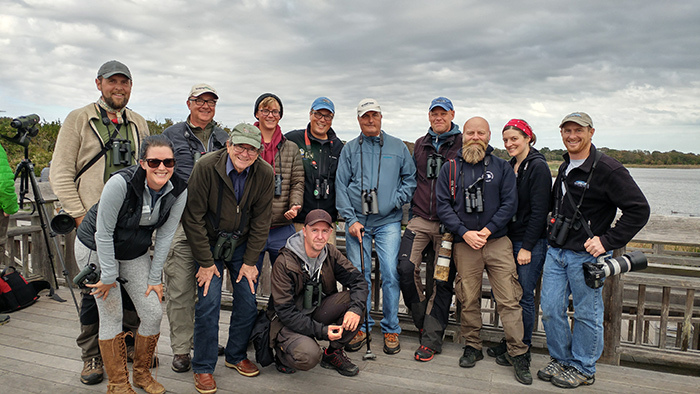 Before the conference kicked off, we had several memorable days of wall-to-wall birding, aided and abetted by the friendliest, most accommodating team you could possibly imagine, and the aforementioned tagline seemed more appropriate by the hour. Whether in the midst of the morning flight of thousands upon thousands of Yellow-rumped Warblers swarming southwards past Higbee; witnessing the streams of Icterids gunning overhead peppered with bounding Flickers, bulleting Merlins, fluttering Meadowlarks, undulating American Pipits and squadrons of Cedar Waxwings at Coral Ave; picking out White-wingeds among lines of Black and Surf Scoters as they powered along the coast; or relaxing on the Hawkwatch platform with friends old and new as low-flying falcons, Cooper's and Sharpies out-stripped Northern Harriers, Ospreys and various Buteos against a backdrop of plague-like clouds of Tree Swallows murmurating around the lighthouse. 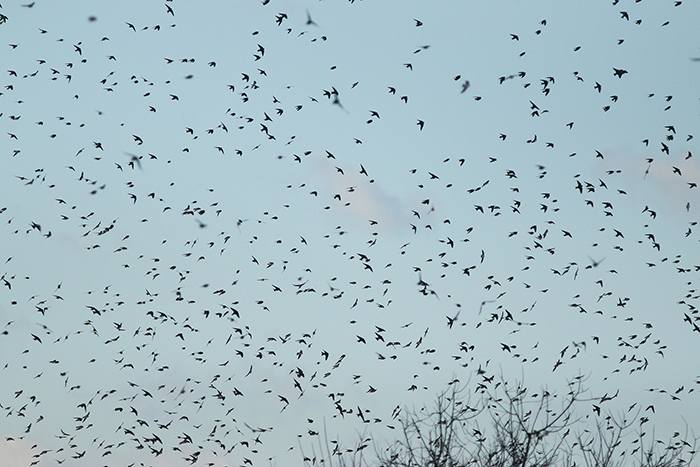 Even during those extended pre-conference sessions there were nowhere near enough hours in the day to fully soak up the spectacle, and for the more bird-hungry among us, it didn't stop there. Even after the conference began, scrambled pre-breakfast (and lunchtime) hit-and-runs were too much to resist - the perfect inspiration to take back into the hall, where more inspiration awaited; the best of both worlds, on the same paradisiacal doorstep. 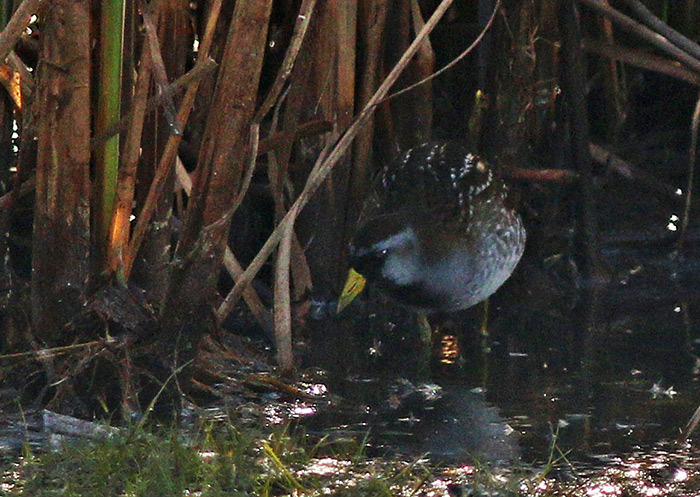 A half-hour spare may entail a lunchtime stroll for almost point-blank views of Sora and Virginia Rails at the Meadows, a wander over the road from the conference hall to watch inshore Bottlenose Dolphins playing in the surf, or a drive up the beach road to experience the huge swathes of shorebirds, testing ID skills by separating Western and Semipalmated Sandpipers or picking out Marbled Godwits roosting on the brackish pools. And then, of course, there were the Monarchs. Again, the time of year reduced any expectations we had of the mass butterfly migration we'd heard so much about, but Cape May went above and beyond the call of duty yet again; we were privileged to experience the full effect of this magical and sadly increasingly threatened miracle, as waves of Monarchs battled bravely into strong winds, some arriving in off the sea, others following the line of the beach, and others looking for communal roosts to join. So many birds, so many bird observatories, so many lessons, and so many new friends. Here's to the next IBOC!